I know I’ve had a good day when I get home, physically ready to sleep for a week but mentally running like the Duracell bunny. A few days back, I spent the best part of seven hours learning and laughing with teams from community engagement projects, The Lab and the Cheerful Project. 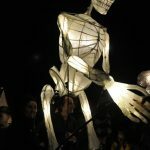 We had gathered for training on how to make procession skeleton lanterns so we could in turn, guide the community to design their own. 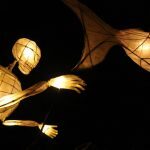 This was in preparation for the River of Lights Festival in Haverfordwest, inspired by a folk tale of the Skeleton Woman and the Fisherman. Having seen a request for volunteers to help run workshops over half term, I jumped at the chance to get my hands gluey and learn a new craft. I fully support the objectives of socially engaged arts and so I was also passionate about encouraging others to do the same. When the day came, I pootled down to the old Ocky Whites building in Haverfordwest (nice to see an empty space back in use) on a cold, yet refreshingly bright October morning. Within seconds I was greeted by smiling faces and here I introduced myself to the rest of the team, over a warm and welcome brew. 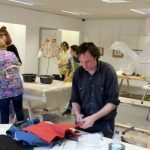 Artist Toby Downing was our tutor, a softly spoken guy, passionate about his work and sharing it with us for the benefit of the community. 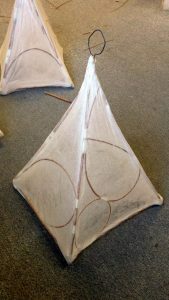 I discovered the majority of the team had already completed Part 1 of the course (Oops) – making a basic triangular lantern. 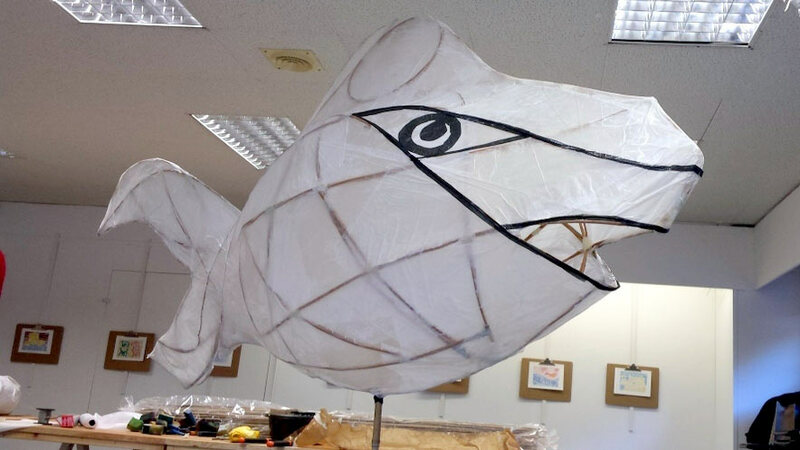 Today was Part 2, experimenting on a larger scale to complete a school of oversized fish, to lead the parade. I was in my element and dying to get hands on as soon as I could. 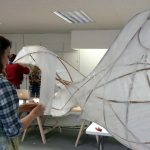 Toby led with an overview of the basics, tips and tricks for sculpting and a demo on how to work the willow to form the core structure. 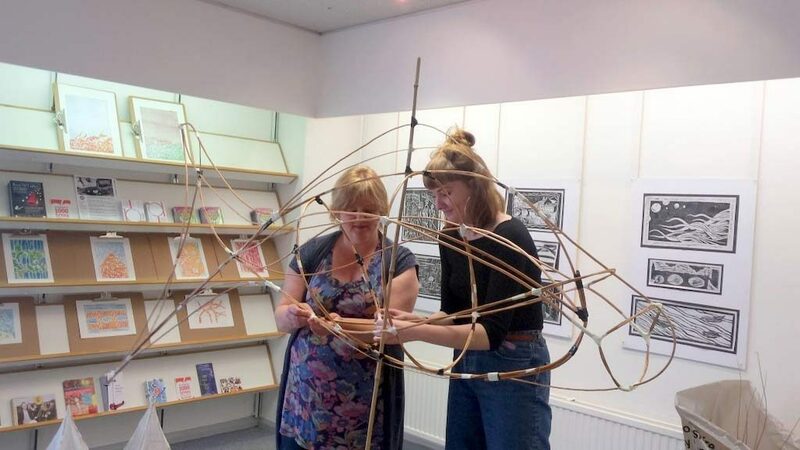 In small teams we designed and crafted our own skeletal fish, which took on various guises as we progressed. 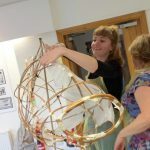 Sticky tape was our friend as we built on the intertwining sections and good communication was vital as we organically fell into team roles; the creative thinker, the people pleaser, the technical designer and the practical sculptor. I thanked the others for encouraging me to design more freely (perfectionism and willow craft are not friends!) and vice versa for some, as they realised they needed to pay more attention to symmetry and the solidity of the structure. 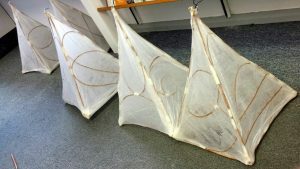 Our ‘shoal of lanterns’ developed well and just before noon, we added details such as a tail and fins as we gained confidence in our ability. After lunch we approached stage 2, learning how to apply the skin. 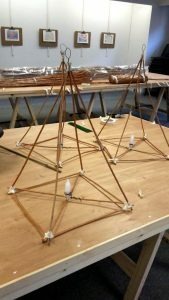 This would encase the willow frame and provide enough transparency to allow candlelight to penetrate through of the parade. 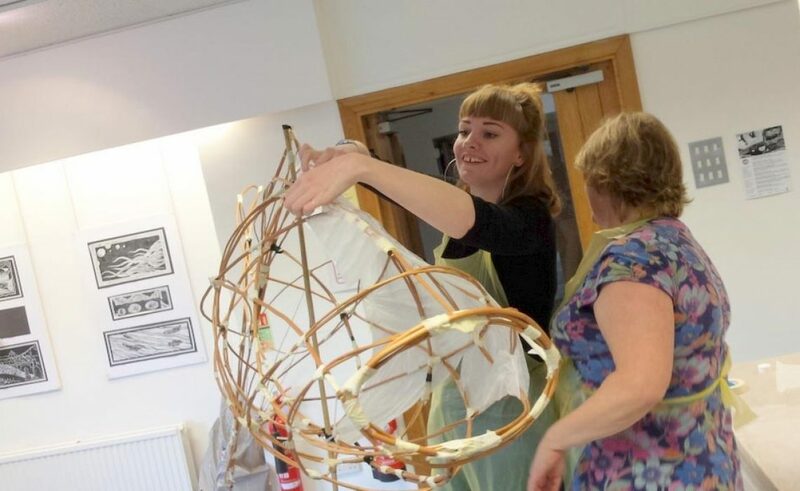 We soaked random shapes of ‘special’ paper with a PVA and water mix and carefully laid each piece around the skeleton frame, making sure each section had a slight overlap. 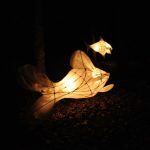 What seemed like hundreds of pieces later and with the addition of some eyes, we watched our giant willow sculptures literally transform from hollow structures into creatures with their own persona. We stood in awe of the floating amphibians, amazed at what ‘we amateur sculptors’ had managed to produce. Toby was obviously a very effective teacher. 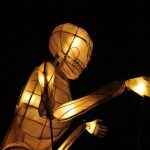 In two weeks, the mass lantern build will begin via community workshops in Haverfordwest, Maenclochog and Clarbeston Road. 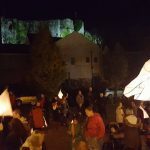 A community parade around the town and along the river of Haverfordwest, involving the makers and their lanterns, music, storytelling, fire drawings and a grand finale. A perfect, ‘family fun date for the diary’ for Halloween. Activities like this are vital for those feeling isolated in rural areas and to rekindle community spirit. 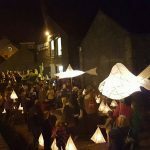 I am keen to see how more of these projects can have a positive impact on the community. It was a ‘train the trainer’ day today and despite initially working outside my comfort zone, I left with a little smile on my face having learnt a cool new craft and chatted to people with a similar mindset. Most importantly, I was content in knowing what a treat those coming to the workshops have in store. A fabulous and productive, fun filled day all in all. Nice work guys…encore encore!